The Samsung Galaxy XCover 3? 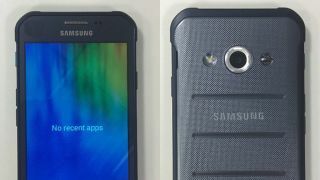 Samsung has recently taken to releasing "ruggedized" versions of its flagship phones, like the Galaxy S5 Active. But don't forget that the Korean company also has a seldom-mentioned line of smartphones entirely dedicated to surviving rock climbs and mud puddles: the XCover series, the latest of which has apparently leaked. These photos allegedly show the Samsung Galaxy XCover 3, a phone that hasn't been announced by Samsung but could very well be in development at the same time as the Galaxy S6, knowing how many balls the company likes to juggle. Samsung's last XCover phone, the Galaxy XCover 2, was released way back in early 2013, so if the XCover 3 (model number SM-G388F) is legit you can expect it to be a massive upgrade over its predecessor. Then again if you've been using the durable XCover 2 since then your phone is probably still in great shape. Various sources on the XCover 3's specs claim it will sport a 4.8-inch 800 x 400 display (much larger than the XCover 2's), a Marvell Armada PXA1908 chipset and quad-core Cortex-A53 CPU, 1GB of memory, and 8GB of storage.